It would be most beneficial to not only purchase the material mentioned but to also get all Official AAMC tests. 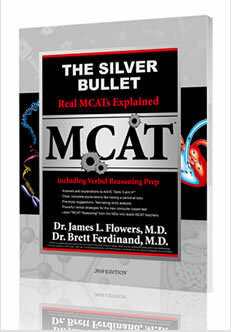 The Silver Bullet: The real MCAT Explained contains explanations to the answers of the MCAT Practice Tests that were released by the Association of American Medical Colleges. The answers to Practice Tests III and IV, as well as the answers to all MCAT Practice Items are clearly and completely explained in detail. You can think of it as having your own personal tutor. Furthermore, it provides powerful verbal strategies for the new computer based test, pre-study suggestions, and test-taking skills analysis. In addition, this study guide also includes a full-length simulated practice exam along with answers and explanations, equation lists to memorize for the exam, eight pages of new 3D color diagrams, and an organic chemistry summary. This Verbal Reasoning website, prep courses and review described herein and the trademark The Only Prep You Need are owned and operated by MCAT-prep.com and RuveneCo Inc. Information regarding changes to the new test including the Writing Sample can be found here. To purchase online courses or books, videos or MP3's, we recommend The MCAT Books Store. This website recommends Futuredoctor.net for premed information. The website www.aamc.org is the official website of the Medical College Admission Test which is not affiliated with nor endorses our products.